Deep in the South a baby was born. This wasn’t an ordinary baby, this was a 14 pound hammer knocker that took momma quite a while to recover from the labor of birth. 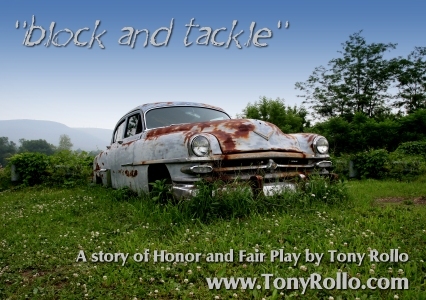 From early on this big ‘ole lil’ boy showed incredible strength which earned his nickname “Block And Tackle”. When he was still quite young his nickname was shortened to just “Block”. Even at three years old this boy could out wrestle anybody three times his own age. He was quite a help around the house when he became a teenager if his momma and daddy needed any heavy lifting. If momma needed to sweep under the stove or refrigerator, all she needed to do was give Block a call. Without a grunt he could hold it up as long as was needed. When Block became a young man he discovered a talent at dirt track racing. He was hard to beat on any red clay oval. When he wasn’t racing he was always looking out for old cars and good motors that he could turn into metal monsters of victory. Because of his prolific winnings, he was able to pay good cash for junk cars to further his vocation. One spring, he had heard of a particular farm a couple of counties away where there were quite a few candidates of rust just waiting to be had in an old cow field. As he was driving his pickup truck looking to find this Shangri-La of metal he heard about, Block happened to pass an old farmhouse and figured he would stop and ask for directions from the old farmer sitting on the front steps. Block parked his truck halfway up from the road to the farmhouse and walked the rest of the dirt driveway. The old farmer was busy whittling away at a piece of wood as he sat on the steps of his weathered, wooden porch. As Block came within greeting distance of the old farmer he noticed an big car engine sitting in front of the farmers barn. It was perfect and complete with its transmission and looked as if it was just removed from some old muscle car and placed atop a pair of concrete blocks. Block stopped in his tracks. The old farmer continued to whittle away at the wood in his hands with his old timer blade. For the moment Block completely forgot about his quest for the old rusty treasure that had brought him so far from home. “That’s a nice old motor you have there!” Block exclaimed. “Yep. That it is.” said the old farmer without looking up. Block pretty much never heard the word “no” from anybody. Maybe it was because of his size. Maybe it was because of his reputation in his home county. Block’s grandaddy was the first to teach him that every man has his price, so he was not about to take no for an answer. Block was taken aback. There was a moment of awkward silence. Sort of like that moment in an argument when there is nothing else to be said before the fists start flying. In Block’s mind, he perceived a tough mule trader before him. He was convinced the old farmer would take his money eventually. Block wasn’t about to leave without that prize of a motor. But in reality, the old farmer was just being as truthful as the day is long. The old farmer was just as perplexed at this big strapping fellow’s persistence. Is this boy picking a fight with his elder or just being disrespectful? In the farmer’s younger days he might have started a scrap with a boy like that despite his size. In fact he had whipped many a foe over much less in his day. But due to his advanced seniority and Block’s youth and gargantuan size, the choice was obvious. A dose of good, Southern rhetoric was in order. The old farmer decided to utilize one of the quickest ways to end a conversation with anyone who won’t take a direct hint. Just give out an impossible task and allow the solicitor to realize the futility in their persistance. Block felt relieved indeed. He wondered to himself why this old farmer had been toying with him if he was just going to give him the motor anyway. Nature had given Block great strength and size, but in balance it took a little away from his pattern of thought. Besides that, he was still a young man and had not yet mastered the art of an older man’s wisdom nor the experience. Block gave the old farmer a big country grin. The old farmer cocked his head a little sideways in confusion. He had never met a boy as dumb as a bag of hammers as this one. Block walked over to where the engine sat. The old farmer was still trying to figure out if this boy was just dumb or hard of hearing. “What are ya up to?” The farmer asked in wonderment. Block squatted down a bit and grabbed the motor with one hand under the front and his other hand under the back. Without a single grunt, he snatched it up into his arms like a mother picks up a newborn baby. “Just what you said, friend.” said Block to the old farmer. The old farmer watched in speechless amazement as Block walked effortlessly with that big block engine to his truck and lovingly set it over the tailgate into the truck’s back bed. “Much obliged!” Block called back to the old farmer. Both men were now caught at an impasse. The boy did exactly what the farmer never expected he could do. So now the farmer could do nothing but what was right; to honor his word. To do anything else would be equivalent to the end of the universe in a Southern Gentleman’s heart. The old farmer slowly sat back down on the porch steps. He pulled out his handkerchief from a back pocket of his overalls and wiped his forehead. In Block’s mind he had acted completely within logic and fair play. But at that moment there was a spark of thought. A rule of Southern honor began to ring in Block’s mind that had been passed down to him by his Grandaddy. It was an opportunity to do what was right and fair. Block walked to where the old farmer was sitting. He reached into a pocket of his overalls and pulled out his roll of cash. He counted out nearly twice what the motor was worth wholesale. Block turned and walked back to his truck. He drove a way with his prize forgetting about his original quest for the Shangri-La of rust he had heard about. The old farmer waved goodbye as the truck disappeared in the dust. Both men were just as happy with the outcome because honor had been served.